As we learn to love and respect the nature that surrounds and sustains us, we learn more about the energetic link that connects all creatures on Earth. Our ancestors acquired vast knowledge from animals, and related to them on a more personal level: animals and insects were not considered lower on the evolutionary scale, but had much to teach us humans relating to survival and sustenance of the land. We now explore a variety of distinct species, their significance within the earth's energetic link, and the implications of finding yourself in the presence of these beautiful creatures, the cat. 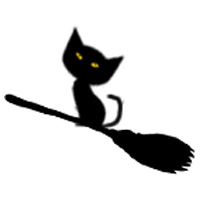 Many of you have asked why we have a Black Cat as our Coven's symbol when one crossing your path is considered a symbol of bad luck. Though there is value in the origins of this association, cats are wondrous creatures who had taught early man to provide for themselves, and maintain a healthy and sanitary lifestyle. It is said that this superstition had originated with King Charles I of England in the 17th century. He had loved his black cat very much, and even had his Royal Guards ensure that his cat remained safe. The day after his cat passed on the King was arrested in the midst of English Civil War. The King's supporters had claimed that his cat was the source of this misfortune, and some even believed that this cat was a Witch in disguise. From there, rumors had become widespread, and it did not help the black cat's cause when one was seen crossing the path of a crew of British Sailors who would eventually be lost at sea in the late 18th Century, along with other similar occurrences. Nonetheless, there is some truth in every superstition, including that of the cat. Many faiths hold it true that Spirits of the deceased manifest themselves in the bodies of cats, in order to transmit a message that they were unable to accomplish in their lifetime. These cats act as conduits between the Spiritual and the Physical. 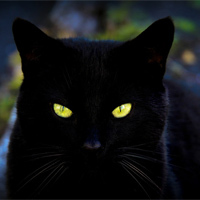 Though it is based on faith and feeling more than evidence as many would prefer, cats, both wild and domesticated, are associated with the Spirit World, having a connection with both the living and the dead. This idea is supported by the notion that cats frequently choose their companions themselves, rather than allow themselves to be a captive in an unwilling relationship. They are very sensitive to everything around them, always having a keen eye on their surroundings, and quickly noticing any movement. Cats are very patient, and can wait seemingly forever to get what they want. If we are willing to learn, we can gain vast knowledge on staying attuned, serenity, and a little piece of mind. We would love to hear of any stories you may have about a cat, whether it pertains to the importance of the feline, or just a funny story! i have a mini potbellied pig. she is intuitive, very aware and involved. I have six cats who all have their own personalities. They all are very in tune with what is going on and it is true that they are very patient. Cats do pick who they like. Two of my cats, both felines, love to hang out with me at bedtime. Hi , I have been pretty fit but recently my leg and body over weight I have twisted my leg. I look at my self and look I'm looking at another person fat low esteem. I was recently adopted by a small black and white cat who walked into my house on this past Halloween and decided to stay. I knew the minute he walked in while I was passing out treats that we had an instant connection. I think he knew that I needed a witch cat. He's been part of my family that already included two dogs and another cat. I feel very lucky that he did choose me, because I know he did exactly that. Just recently a beautiful black boy cat showed up at my doorstep. My life is in a stage of changing careers and still such heartbreaking sadness due to a break from my sons father who married a girl 20 years younger that is not a US citizen . He married her after 1 year of dating. (we had been together for 6 years) I've been told by a psyic that he loves me and is going to come back to me. I have paid for your help with reunited love spells and so many full moon spells. But yet still nothing has happened. I was very low when the cat showed up, is he here to help or harm ? I know that ever since he started dating her everything has gone wrong for me. I have seven black cats. Simon, my Besty loves magic. I have 2 cats--"Remy" (dba "Creamsicle" as he is orange & white) and "Mid-Night", completely black, as her name implies. Remy is most passionate (yes, passionate!) and loves to sleep with me with his little furry arm embracing me. He has yowled at the top of his voice when I had been absent for sometime, until I would rush to pick him up in my arms. Mid-Night is quite the opposite, and actually seems to enjoy being mysterious and aloof. Strangely, I seem to sense her resentment at being dependent on me for food! I know that sounds strange. But she is very independent, while Remy has no qualms at all at being dependent on me for his needs, and unabashedly displaying his affection. I got Remy from my friend,Mary, who does rescue work with cats. She said she dealt with over 100 cats, and Remy was the most depressed cat she ever dealt with. At Mary's place, Remy jumped onto me and rested his little head against my chest. I had never had an experience like this with a cat I didn't know, and asked Mary if he did this with everyone. She replied "Well, he tries!" She told me that Remy had feline aids, also hematomas in one of his ears, and the other ear had the tip chopped off when he has neutered and then released on the streets. He looked really FREAKY, I CAN TELL YOU! I said "This cat needs me" and took Remy home. Poor Remy was used to rejection because of his looks and after I took him home he was very depressed for a month,when suddenly one day he leaped with joy, climbing up a tree and then jumping down. He finally realized, I guess, that he had a real home.